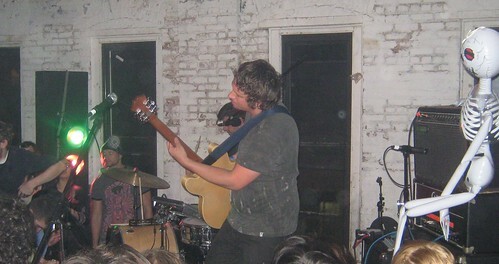 In a week where they played at the fancy Le Poisson Rouge, at MoMA, and at the architectural wonder The New Museum, on Saturday night No Age returned to their lo-fi roots and their longtime friend ToddP and played a venue that was essentially a warehouse and parking garage in Bushwick. The forty-minute set was a non-stop bundle of power and energy, and excited the frantic crowd to the point of a near riot. The set featured a couple of numbers from their new EP Losing Feeling which was released last week. While the band calmly requested that the non-stop crowd jumpers and surfers avoid crashing into the equipment and not hurt themselves, the show came to a halt when one over-ambitious jumper hit the stage and began bleeding at the end of the song — and you can’t make this stuff up — called “Get Hurt”. The band responded to a strong call to return and finished the show at 2 am with a two-song encore. ToddP brought in an excellent sound system for this show and the sound in the venue, considering the horrendous acoustics in the warehouse, was actually quite good. We recorded with a stereo feed from the board mixed with the Neumann’s lifted to maximum height at the soundboard area. The result is a really superb capture of this classic DIY event. Enjoy! If you email nyctaper for access to this recording, we expect that you will PLEASE SUPPORT No Age, visit their MySpace page, and purchase their official releases from the Sub Pop Records website [HERE]. Yeah I saw a girl go down in flames, but I am pretty sure she had no idea where she was anyways. I hope someone got footage of Soft Circle too. Well, I’m glad you’re ok, Alison. Alison, you probably had the best time out of everyone there. I never said you weren’t smiling the whole time. You are a champion. Respect. Boy Void isn’t posted up on the MP3s. Sounds good! Thanks for posting man. I’ve been searching for live No Age for ages.